There is a few films called into the West, so best the title be specific. 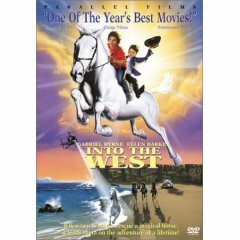 Into the West stars Gabriel Byrne, Ellen Barkin, Ciar�n Fitzgerald, R�aidhr� Conroy, David Kelly, Johnny Murphy, Colm Meaney, John Kavanagh, and the great Brendan Gleeson, among others. Summary: FABULOUS, MAGICAL, EXCITING MOVIE FOR ALL! son-in-law nor his two grandsons-Tito & little Ossie for seven years. The horse follows his caravan and there begins the adventure! You will love the way the boys and magical horse use all their wits to beat the police and greedy man who only sees money in the horse. You'll love the way they say "Hi Ho Silver AWAAAAY!" horse... It's filled with excitment and the boys are so real! Comment: I think into the West is a fantastic family film for all ages. Its a film that touches your heart and makes you laugh and cry and recommend this film as a classic and is a must have to add to a DVD collection. Comment: A very good children's as well adult's movie. Especially if you believe in magic and a mother's love. I would recommend this movie to anyone. Comment: Mike Newell was the director of the fabulous "Enchanted April" and "Dance With A Stranger", but this was more of a children's movie than I had thought. It was OK - I do like both Ellen Barkin and Gabriel Bryne. Comment: Widower Papa Riley (Gabriel Byrne), once an important member of a nomadic tribe of travelers, now lives in the slums of Dublin with his two young lads, Ossie (Ciaran Fitzgerald) and Tito (Ruaidhrf Conroy), drinking himself to death. Their lowly lives take a wild turn when Grandpa Ward (David Kelly) brings them a magnificent (and possibly magical) white horse called Tir na Nog, but when the horse is taken away by the police, the family sets off across the old Emerald Isle to get him back. A great, stirring story for kids and adults.